There was a time in the past when 28 kilobytes per second was the newest, fastest and hottest internet connection. Then along came 56k, to double the speed and bandwidth, providing what some people hailed as the fastest information transfers possible. Of course, now, even the most technologically conservative family has broadband internet. 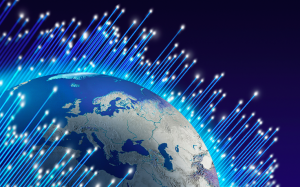 With the widespread prevalence of broadband networks like DSL and Cable, millions of people in the US now enjoy fast downloads, and lightning fast surfing speeds. And yet, just as with the difference between 28k and 56k, the fast lane of the internet is shifting again. While it would be difficult to say that there are not some internet users who are just fine with dial-up or the now prevalent DSL and Cable services, it would also be difficult to count the number of businesses and individuals who are severely dissatisfied with the slow speeds and shared bandwidth of such services. The fact is that no matter how you look at it, the more people who share a broadband cable or DSL connection, the slower it gets, until it dwindles to speeds that barely exceed the old, outdated dial-up modems that used to be the commonplace connection tool. For a business that needs bandwidth to do business, they have to upgrade to at least a T1 line. Because of this, T1 and T3 connections are swiftly becoming the new industry standard for internet service for businesses. With many types of network providers offering T1 services on smaller scales than were available in the past, and with T1 service dubbed the “new fast lane on the information superhighway”, it is easier than ever to get a business running on a T1 connection. T1 service has many benefits, the most prominent of which are its increased bandwidth and dedicated, digital circuit support which provides data rates of 1.544 Megabytes per second (mbps) upload and download. This data transfer speed is a significant boost from the slower cable and DSL which offers much less upload whose data transfer typically rates in the hundreds of kilobytes or less. For faster speed, businesses often look into bonded T1’s where multiple T1’s are connected together . Although this option can be slightly more than a traditional Full T1 service, the added bandwidth allows a maximum transfer speed of 3 mbps with 2 T1’s and can be up to 12 mbps with 8 bonded T1’s. For more information on the fast T1 service, visit www.shopforbandwidth.com, a website specialising in locating the best T1 and T3 providers and other high speed internet service options in your specific local area. Also available is a glossary of bandwidth terms and services to help you better understand why T1 can benefit you and your business.